April 15th is the date in Montana where we transition from measuring snow to rain for our precipitation, so it's a good time to look at the current SWE (Snow Water Equivalent), in our watersheds and try to forecast what's to come in the next 3 months. We'll still get some high elevation snow in the next month (6 inches at Big Sky yesterday for lucky late season skiers! ), but most of our precipitation will be in the form of rain from here on out. April, May and June are by far the three wettest months of our year in Montana, so we can expect some soggy days ahead, and we'll need them to make that solid snowpack pay off in late summer. Aside from the Smith/Judith/Musselshell basin, we look to be in pretty great shape this year; 89-119% snowpack across western and central Montana is excellent and as long as we get near average rainfall and no early onset extreme heat we should be sitting pretty this season. We paid for it this winter with 2+ months of bitterly cold temperatures and way above average snowfall. What does this mean for specific watersheds? Well, that is a bit harder to forecast. Some rivers like the Big Horn and Blackfoot are already running high. Most others are about average to a bit above and are fishing well for spring conditions. They are also providing excellent spawning conditions for our rainbow trout reproduction period, which bodes well for the long term health of our wild trout populations and fisheries. We should expect a solid run-off period for all of our freestone rivers (Yellowstone, Gallatin, Clark Fork, etc. ), and the potential for more intense but shorter releases on our tailwater rivers (Missouri and Bighorn). If you like to fish lower/cleaner water and/or dryflies then the next month is an important window of opportunity for you. Midge, baetis and skwalla hatches are underway on many waters and the fishing is solid to fantastic. There will be a period of time around mid-May to mid/late-June where lots of our rivers should be in some state of run-off, so options will be more limited and you'll have to choose wisely for productive fishing. There are no guarantees when it comes to water and weather, but as of today we like the layout of things to come and we hope for a nice 'average' year from here on out. I was fortunate enough to live in Wyoming for a few years and spent many days fishing on public waters and many nights camping on public lands. As an American, and an angler, public lands are near and dear to my heart. I would not have been able to complete the Wyoming Cutt Slam had it not been for the abundant public land in Wyoming, and I am forever grateful. Backcountry hunters and anglers has an important proposal right now to help avoid conflicts, stem the spread on invasive species, and preserve critical habitat. Please follow this link and comment. Thanks. Here’s a heartwarming look at the Green River, Utah from the perspective of a father & son fishing trip, which is how many of us got into the sport of fly fishing. By the way, the Green River has between 8,000 and 22,000 fish per mile. It’s pretty insane. In 2015, the toxic tailings from the Gold King Mine in southwest Colorado coursed down the Animas River, causing many to fear for the fish and the other aquatic life in the renowned waterway. But the river rebounded quickly, and is fishing as well as it has in years. A collection of beautiful wildlife photos. When dam repairs on Wyoming's Shoshone River sent thick plume of fish-killing sediment downstream this fall, there were worries that this incident would have a lasting impact on the river. And it very well might. But there is also opportunity for long-term restoration of this amazing trout river. Stretching nearly 3,500 square miles, Yellowstone is the 8th largest National Park in the United States. Largely known for its diverse wildlife and geothermal activity, it also has strong fisheries. From the Yellowstone and Lamar to the Gibbon and Soda Butte, there are countless miles of pristine river to fish. With two years exploring Southwestern Montana under our belts, Courtney and I decide it was time to stray from the endless riffles of the Madison River and head east to Yellowstone. The size of the park didn't make it easy to narrow down the options so we stopped in at Blue Ribbon Flies in West Yellowstone for some insider knowledge before weaving through the tree lined roads of the park. Traffic jams are just about as common in Yellowstone as they are in San Francisco, but they're caused by bears and bison rather that texting hipsters on their way to the Mission. Although the wildlife in the surrounding meadows was awe inspiring, we were on a mission for one thing and one thing only. We were after the fabled Yellowstone Cutthroat trout. With it's main diet being insects, even as adults, they tend to come easy to the fly. We settled the car into its dusty resting place for the day and set out over the ridge in search of the river. After working up a bit of a sweat, we found ourselves resting on the river's grassy banks as it snaked it's way through a massive meadow who's only residents weighed in at about 1,400 lbs. Without even stringing up our lines, we were watching fish actively move up and down the banks taking insects off the surface without a care in the world. My only thought was, "This is going to be easy." I took out the camera, it was stunning in every direction. Courtney got started casting. As his fly drifted overhead, the trout just kept making their rounds up stream, then back down, running laps in search of their next meal. He had a few trout inspect his offering, but they thumbed their noses at his fly. Usually, cutthroat are overly surface oriented and eager to take a dry fly. We pressed on and only had intermittent luck as we worked our way through the meadow, hugging the high banks looking for active fish. We spent the good part of the day throwing dry flies. The gaudier the fly, the more it seemed to work. It was almost counter intuitive. With grizzly tracks authoritatively etched in the sand bars, we knew that leaving before dusk was a requirement. We'd need just a sliver of light incase we needed to aim our bear spray on the way out of the meadow. The sun was beginning to lower in the sky and the trout were making circles in the surface of river with greater frequency. We couldn't quite leave yet, it was just about to get good! As Courtney typically does, he fastened a streamer to the end of his line and began working back down stream, lacing his casts between rising trout. Before long, he had the fish of the day on the end of his line. I still wasn't convinced and kept floating my foam near the banks. "On! ", he was tight to another fish and my surprise was turning to interest. After three fish to the net with his streamer, it was time for me to change tactics. It was time to channel my inner Kelly Galloup! The golden hour was spent working our way through the meadow in the company of massive Bison as we splashed Wooly Buggers up against structure, through runs, and against the high banks. The cutthroat weren't shy. When they wanted the streamer, they hammered it hard and made their presence known. It was my first time having a truly successful streamer session and I was changed. Forever. After we each landed a good number of fish we decided to start our haul back to the trailhead. It had been a long day filled with great fishing for one of the more beautiful salmonids I'd seen. As we sweat our way back up the ridge we were chased out of the park by what felt like 10,000 mosquitos. A good reminder that we were only visitors in a place built for the wild. I've come to realize that one of the greatest events of the fly fishing calendar is the annual brown trout spawn in the Fall. As the leaves are turning yellow and red, the really big fish come out of their secret lairs to play. Of course, its never easy to catch 20+ inch fish, but things certainly get easier in the weeks and days leading up to the spawn. With these trophy browns in mind, Alina and I caught wind of a great spot on the Madison River above Hebgen Lake just within the Western Boundary of Yellowstone National Park. Needless to say, we didn't need much convincing to load up the car and head for the Madison. Much to our dismay, we arrived to the sight of a full parking area not far from the town of West Yellowstone. As much as I hate fishing crowded water, the popularity of the spot affirmed the validity of our source - We were in for a treat! The Madison here is slow and meandering, similar in many ways to a spring creek. In many areas the Madison runs up along steep, rocky cliffs where I keep looking up half-expecting to see a curious black bear. The river bottom and bank is rocky and sandy providing great habitat for the fish to spawn out of the lake. Alina and I worked upstream passing many other fishermen, some of whom were busy landing enormous fish. We ran into a couple heading back to their car who advised us to fish Baetis nymphs having had plenty of luck on the small fly. Excited to find our own stretch of water, we traveled at least a mile upstream before finding an unoccupied run. After covering the run without any action we elected to continue upstream. However, in the back of my mind I wondered how much of this water had already been hit earlier in the morning. Coming around a bend in the river we came across another group of fishermen, one of which was fighting a very big fish. Alina and I watched in jealousy as the angler netted the big brown. What followed, however, made me sick. Anxious to snap a few pictures with his catch, the fisherman climbed up onto the bank and proceeded to remove the hook. The fish was placed on the grass where it flopped around for well over a minute as the angler clumsily removed the hook and had his picture taken. When he was satisfied the angler got back into the water and tossed the fish back in without any attempt at revival. Irritated, I actually waded out to pass along a few words of advice, and was only met with an angry dismissal. I wish I would have had the opportunity to explain the importance of good catch and release to that fisherman. What's the point in releasing fish if the don't survive the encounter! - Check out the KeepEmWet Movement <(Link) for some tips and advice! Sorry for the rant. Anyways, Alina and I eventually found a really nice stretch of water that we invested a lot of time into. We focused on the deeper runs and pools without any luck before stopping for lunch. While I was eating, I noticed a single rising fish at the tail end of a run. Eager to go after it, I quietly waded out and worked a small Baetis nymph over the spot. On the third or fourth pass my indicator vanished and I set the hook. In an explosion of water, a huge brown with fantastic orange coloring leapt into the air. After a good fight Alina netted the fish and I let out a sigh of relief. We kept the fish submerged below the surface as I removed the fly and Alina got her the camera prepped. After a couple quick shots I revived the fish until it was ready to swim away on its own. Our trip to the Upper Madison was a mix of tremendous highs and painful lows. It is a truly stunning and breathtaking environment to fish in. And as happy as we were to have each caught a really big fish, I just could not get over the thought of the fish that fell victim to poor catch-and-release. We are so lucky to live and fish in a state with abundant rivers and trout, but more effort needs to be made to educate anglers on proper catch-and-release practices. Please Keep Em Wet! The fish will thank you, and so will your fellow fishermen. After a long hot summer of closures and restrictions on the Big Hole we finally got some cooler weather and rain. With flows up, temps down, and restrictions lifted, it seemed like as good a time as any to give the Big Hole a shot. Going off the advice of Larry, a Big Hole veteran, a few of us loaded up and headed out to the Jerry Creek Bridge public access. I have to say that the drive out to the Big Hole was worth the trip alone. It was an early fall morning and the mist was still rising off the river as we followed the curving road through the canyon. The cottonwoods along the bank were shinning bright yellow as the sun peaked up over the tall canyon wall. Below us, the river seemed to pull all of fall's beauty into a single being. 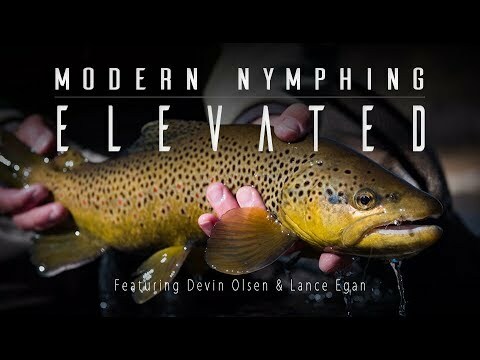 With the best of summer dry fly fishing behind us, we started with a combination of streamers and nymphs, placing special emphasis placed on san-juan worms, prince nymphs, and minnow/sculpin patters. Working up from the bridge I was immediately surprised by how slippery the wading on the Big Hole was, and carefully worked my way out into a riffle above the bridge. It didn't take long for me to pull in a nice brown on a zonker minnow. Everyone else was catching fish too, most of which seemed to prefer the smaller bead head patters. Whitefish, rainbows, browns, and even a small grayling were all caught. I did pretty well with a small soft-hackle trailing off the zonker by about 12 inches. As the morning wore on, the fishing seemed to slow down, so we decided to head back to the bridge for an early lunch. Afterwards we worked downstream from the bridge to seek out new water and get away from the few fishermen we'd seen upstream. Not far from the bridge we found a nice riffle that we spread out to fish from both sides. TC, who as of that morning had never fished with a nymph, hooked into a really nice rainbow which leapt out of the water a few times before breaking off. I got a couple light hits on the streamer, but didn't manage to hook anything. Continuing downstream we caught no fish, and had little in the way of action until we returned to the same riffle a couple hours later. There again TC caught and (This time) landed a really nice 16-inch rainbow on a prince nymph. With our daylight fading we decided to pile back into the car and head a little ways downstream to try some new water before calling it a day. Not too far downstream of the powerhouse bridge we found a good spot to finish out the day. The sun was quickly dropping behind the mountains, and to our great excitement a really nice hatch of BWO's came out to play! Since the sub-surface fishing hadn't been much good, it was a relief to see rising fish, some of which were of good size too! Alina was the first to hook up on a nice rainbow. TC and I did the same not long thereafter. After a short while the hatch subsided and the rises slowed. Satisfied, we decided to call it a day. Overall, my first trip to the Big Hole River was excellent. The sheer beauty of the river and surrounding valley was breathtaking. Fishing seemed best in the mid to late morning, and persistence certainly seemed to pay off when it came to nymphing. With the brown trout getting aggressive and hungry before the spawn I'd have to imagine that fishing is only going to get better, so get out there and partake of it while its good.